Stand-out efforts on the freshman football and basketball teams have Cody Martin in demand with both the track and baseball coaches. And to complicate matters further, his personal life's a mess since his dad remarried-and now Cody thinks Pork Chop might be using performance-enhancing drugs. 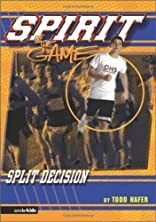 When Pork Chop's coach confronts Cody, he is forced to make a tough decision-lie to the coach or risk losing his best friend. What's the right thing to do?